At The Lighting Superstore you will find an extensive range of wall lights, ceiling lights, spot lamps, bathroom lighting, kitchen lighting, ceiling pendants, table lamps, floor lamps, LED, low-energy lighting, security lighting and outdoor/garden lights, all at great prices and available for fast delivery. We very much look forward to being of service to you. Interior lighting is arguably the most important element in your home decor. It is instrumental in setting the mood of any room in your home. Outdoor lighting can totally transform your garden both from a decorative point of view but also from the point of view of safety. Choose from a huge range of garden lights. Bathroom mirror lights are an extremely useful addition to your bathroom and you'll find a large range designed to complement your bathroom suite. Lamp Shades offer style and function to your table & floor lamps, wall lights and ceiling lights. There is a large range of styles available. The days of Low Energy Lighting being about flickering compact fluorescent bulbs that take ages to warm up have thankfully gone. 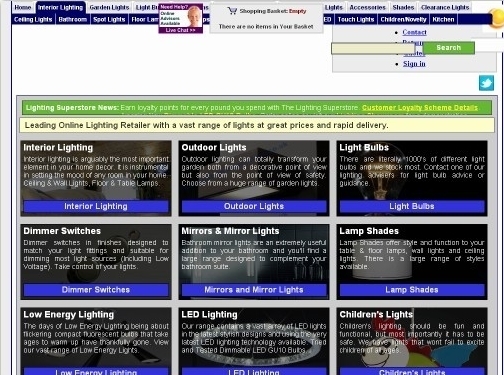 View The Lighting Superstore vast range of Low Energy Lights. The Lighting Superstore range contains a vast array of LED lights in the latest stylish designs and using the very latest LED lighting technology available. Tried and Tested Dimmable LED GU10 Bulbs. Children's lighting should be fun and functional, but most importantly it has to be safe. We have lights that wont fail to excite children of all ages. Bathroom lighting needs to be bright and fresh giving good visibility. Ideally the scheme should be flexible giving a bright and invigorating light. Crystal Lighting creates a beautiful light with an unmistakable sparkle as the light reflects from it, with lead crystal being the most effective. Security Lighting performs a very important function but can also add a great deal of convenience to your garden lighting. Talk to The Lighting Superstore lighting advisers today. UK (Wiltshire) based company offering lighting products for the home. Website features full e-commerce facilities, delivery / returns information (under Customer Help), full company contact details.